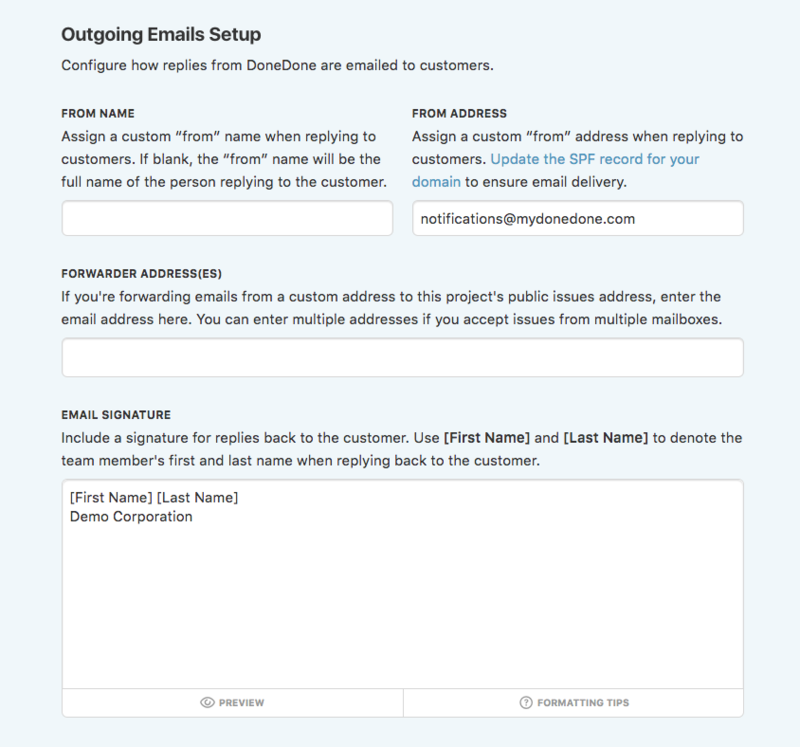 From Name: Assign a custom “from” name when replying to customers. If blank, the “from” name will be the full name of the person replying to the customer. From Address: Assign a custom “from” address when replying to customers. If you update this field, we strongly recommend updating the SPF record for your domain to ensure email delivery. Forwarder Addresses: If you're forwarding emails from a custom address to this project's public issues address, enter the email address here. You can enter multiple addresses if you accept issues from multiple mailboxes. Email Signature: Include a signature for replies back to the customer. Use [First Name] and [Last Name] to denote the team member's first and last name when replying back to the customer. You'll see this signature when you preview a reply inside of DoneDone. Under the Project Settings panel, scroll to the Outgoing Emails Setup section and fill in the values you want to set for outgoing emails.